Maggie Jennings is represented by the Rebecca Hossack Gallery, London W1. 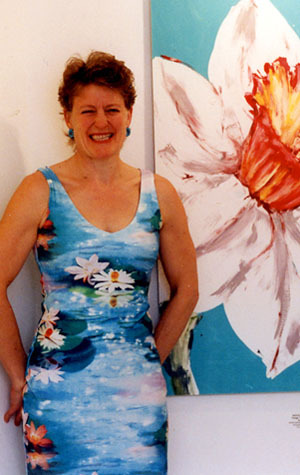 Exuberant, colourful and vibrant, Maggie Jennings?work celebrates the energy of living things. She works with the vigour and dynamism that she perceives in the world around her to produce strong sensuous images that glow, breathe and proclaim their existence with a sense of certainty and pleasure. They flaunt their vitality in rich colour. The main body of work is in the form of spontaneous, gestural mono-screenprints. 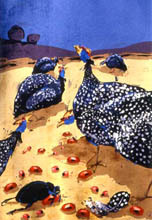 Using sceenprinting techniques, but, unlike a traditional editioned screenprint, no stencils are used and all colours are used simultaneously. The squeegee allows only a very thin layer of colour onto the paper, which gives luminosity. The impossibility of eradicating mistakes focuses the attention totally, and the enforced limited time factor demands great energy, which is evident in the result. She teaches Printmaking part-time at The Prince’s Drawing School. Her work is shown nationally and internationally at Art fairs, group shows and Print Folios currently touring India, USA and Europe. and Kyustendil, Bulgaria; Awards in “Art in Nature? Daler-Rowney Purchase Prize; Featured on BBC series “The Art? Pratt-Silvermine Purchase Prize; Artist exchange in Namibia. She has taken workshops in Namibia; Zimbabwe; Romania. Featured in “Art for Sale" for The Guardian newspaper. Residency in computer imaging at London Print Studio: Artist in Residence, University of Westminster. Greek Government Scholarship, Scholarship Uni. Internationale de Santa Cruz, Canary Isles. She has also made some short films?Wrestling Rhythms, What My Body Does, Flicker. She has work in National & International Collections.